While it's only been about a week since the last recap, I feel the need to document another update. The reason? The whole thing could be decimated by Hurricane/Tropical Storm Jose by Wednesday. WTF. 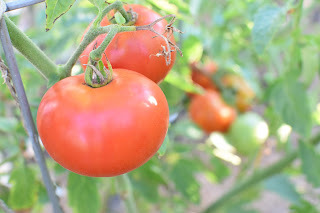 The idea of the wind turning all my tomatoes into a homemade windblown tomato fight seems terrible, so I'm trying to prevent that from happening. 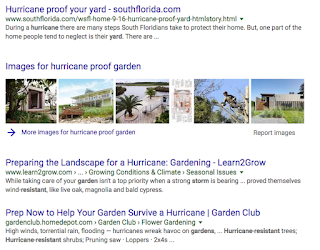 Turns out, the internet is not very helpful. 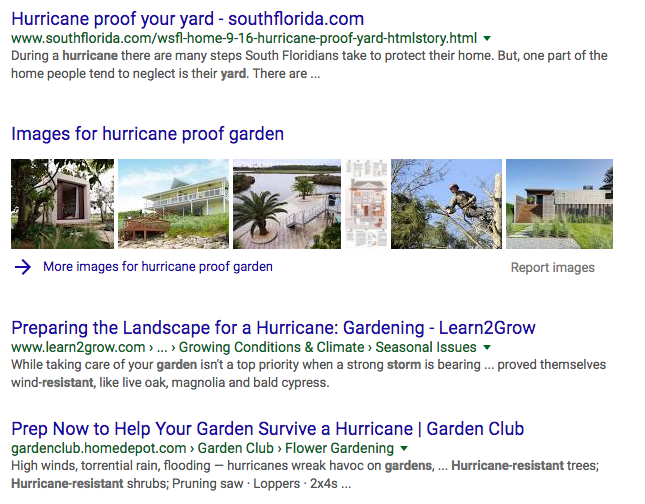 Despite googling "hurricane proof garden", I'm getting a lot of advice about sandbags and what trees to plant. Nothing that really helps me with 3 days notice and in an area where I can't plant trees. So my strategy is really going to be to prune up the plants, pick any fruit that is within a week or so of being ripe, and hope for the best. But to be real, I'm eating like a lot of tomatoes. All the time. 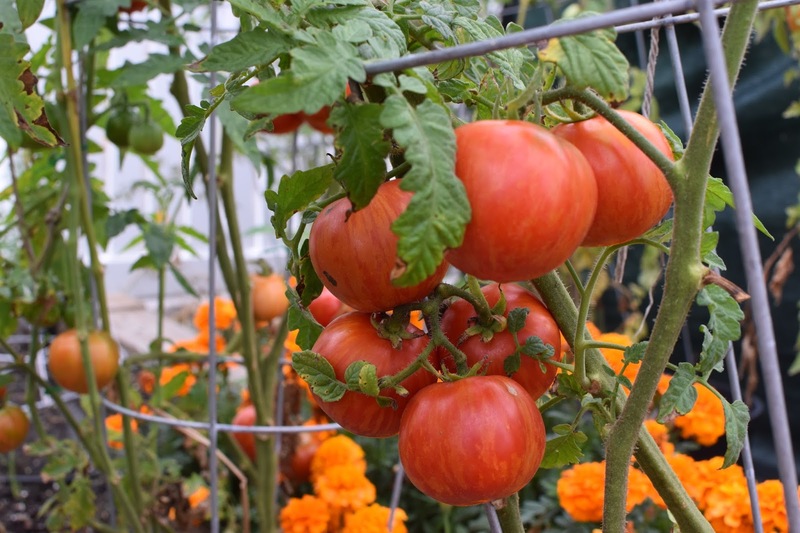 I probably have at least one tomato a day? I'm not sure what the difference is this year but I'm having a harder time giving them away. 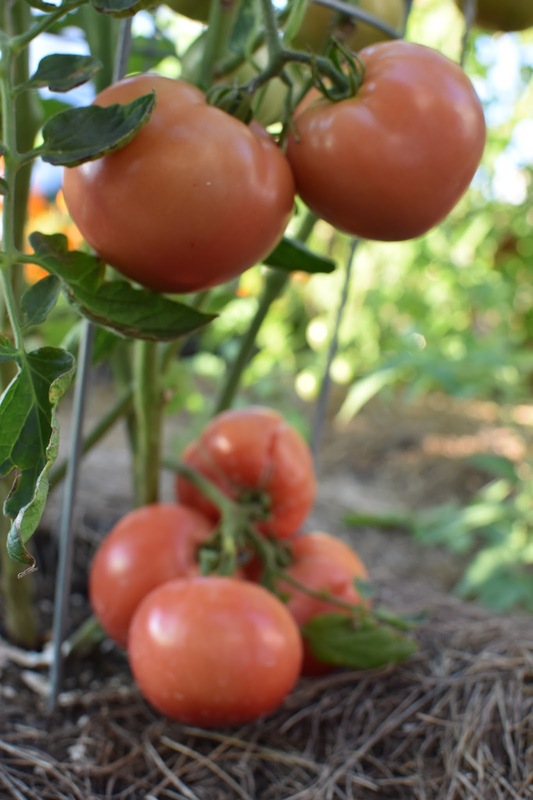 I think since the prime tomato season is about two weeks later than in 2016, most of my seasonal neighbors have left so I'm left with all my tomato inventory. More sauce for the winter? With regards to the rest of the garden... Last weekend (or so), I pulled out all the snap peas since they were past their prime and in doing so found two surprise tomato plants! I have no idea what they are growing from so that'll be a good surprise. Based on their location, they could be the yellow from last summer or the red lightening from this year. Or well anything I guess because I tilled all the soil in this garden and moved it all around. 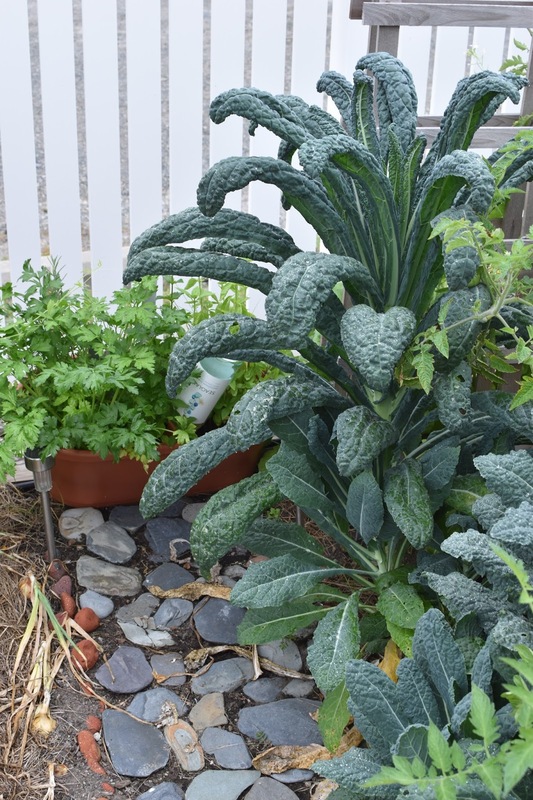 Otherwise, the garden is growing like a normal person's garden. Largely things are productive and not out of control. Last year the tomato plants were insanely productive and required weekly trimmings to keep the growth under control. In a slightly fortunate way, the early season disease issue helped to stave off the insane growth because I had to prune so aggressively. But here's the rundown of where things are! 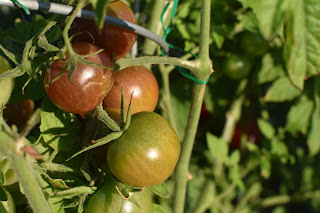 tomatoes // some real varied updates here. Red Lightening? Good. Orange Juice? Just ripened this week. These suckers are huge! Black Truffle? Lots of fruit on this plant. Black Cherry? My ultimate favorite this season. Mystery plant? Still a mystery. Kale // really shot up. This week I put "preserve kale" on my to-do list. I hope I do a better job this year than last. I took all the kale into the giant bathtub to wash it off, then I chopped it all up ... and then I found a bug. So I tossed it all out. What a waste. I can do better this year. Carrots // beyond crushing it. They are going to be fine in the ground for like another month (if not longer), so I can focus on the tomatoes and kale for now. But, if you need carrots? I'm your girl. Radishes // Again, I need to be better about eating these. They are overgrown at this point. 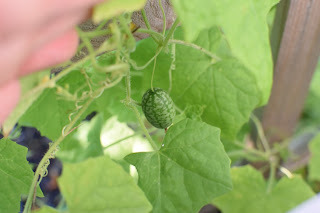 Mexican Gherkin // More little yellow buds showed up in the last week. I didn't do anything different so maybe the weather was just right for them - or the slow death of the zucchini means more life for the mexican gherkin. Onions // Ready to come out of the ground and be dried! Peppers // So some new flowers popped up this week on the yellow and red pepper plants. I'm not going to get my hopes up, but this would be pretty great. I have literally gotten 1 normal pepper this year. A few jalapeños did show up too! Eggplant // no new flower babies - but I'm not sure that I'll grow this again. I haven't actually been motivated to try the eggplant that I so lovingly selected and grew. So far this season I've got 2 baby eggplants from this one bush. Zucchini // A few new flowers showed up last weekend. I almost thought about picking one of them and frying that sucker right up... and then I continued to just only eat tomatoes. 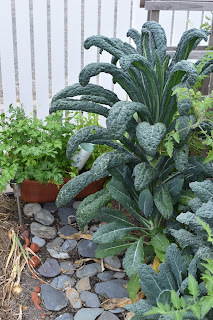 It's been over a month since the last garden update and a lot has happened. 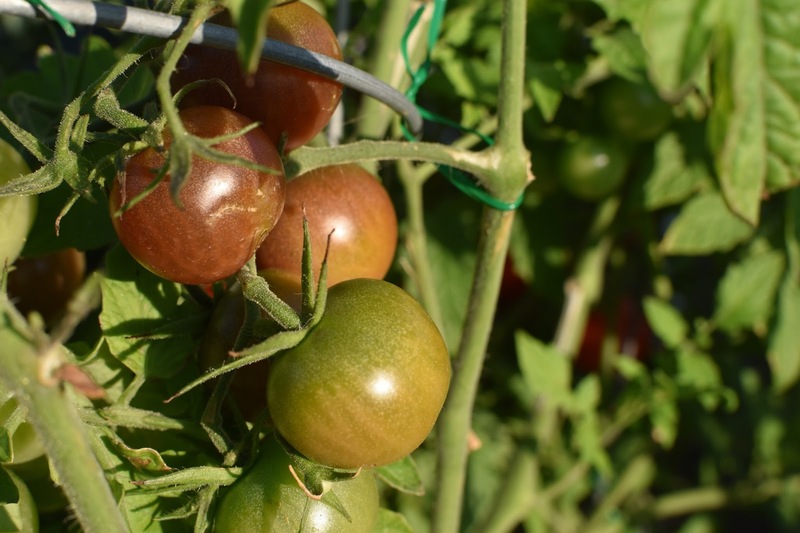 The majority of the tomatoes flipped from green to red, the beans have been harvested, and so far none of the giant tomato caterpillars have arrived. Small victories. A little part of me is nervous every morning that I weave my way through the rows checking for ripe fruit but I've been lucky so far. 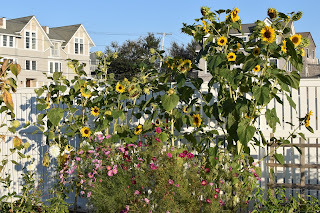 The flowers have been doing pretty well - with the sunflowers really stealing the show. It's pretty awesome when people compliment them from the street. 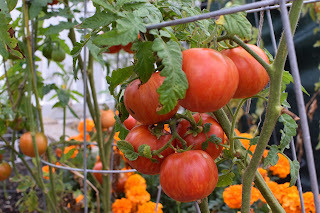 But they really take care of themselves - and the most impressive ones actually grew themselves from last year's leftovers. 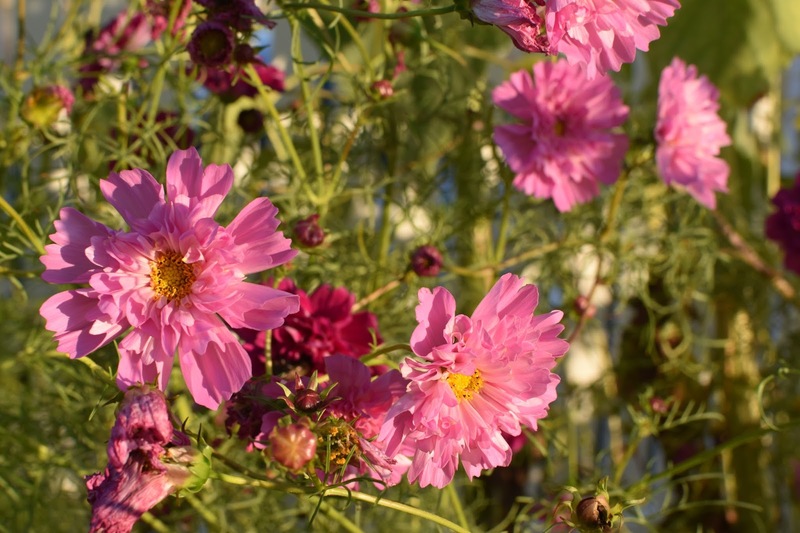 The white dahlias are managing to hold on and the cosmos continue to attract so many bees. I love it. 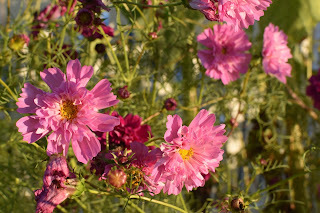 I did plant a second batch of cosmos to hopefully extend this season into the fall a bit. We'll see how that goes. I won't say that I've been super pleased with all the veggie varieties this year. 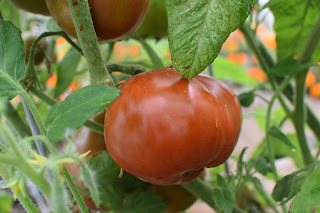 I'll write that all up in a tomato recap but some of them have been amazing and some have been pretty bland. The most ridiculous part is the one I like the most is a mystery variety. I got a letter from Burpee a few weeks back letting me know they had some mistakes in production and my "Black Krim" is not actually "Black Krim". The next week I got a second letter from Burpee letting me know that my "Purplesnax" carrots were also wrong. So no red-purple tomatoes and no purple carrots. tomatoes // a real mixed bag of feelings here. Red Lightening? Looks awesome, but not incredibly flavorful. Razzle Dazzle? 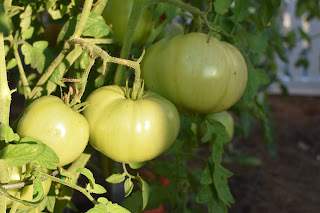 Sad pink color when it's ripe - but great for beefsteak slices. Black Truffle? Only one so far, but my favorite 2016 carryover. Orange Juice? So big... but not ripe yet. Black cherries? AMAZING. 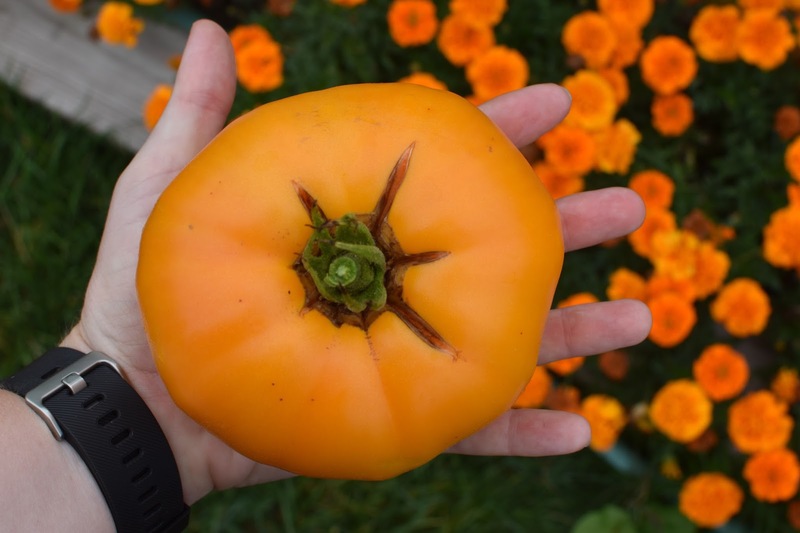 Mystery tomato? Perfection. beans // harvested a few weeks back and tossed in the freezer for the winter. Next year? 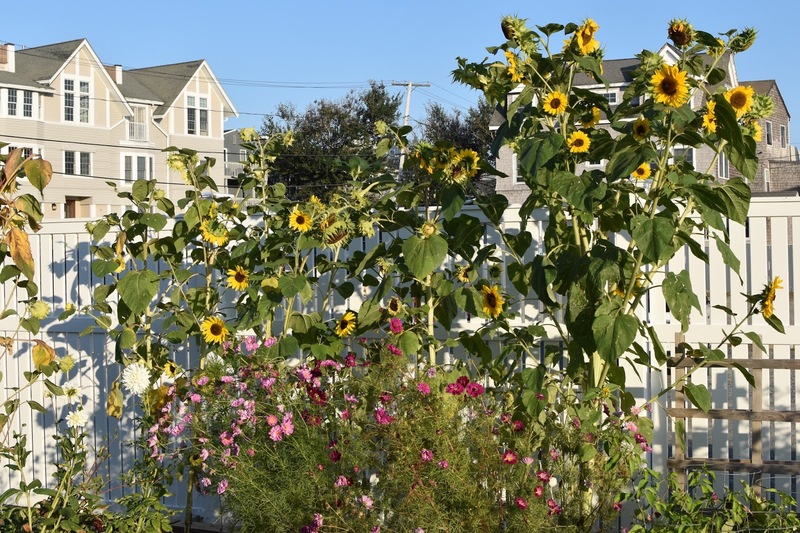 Grow some pole beans to take more advantage of the vertical space. snap peas // overgrown and I never really captured them. 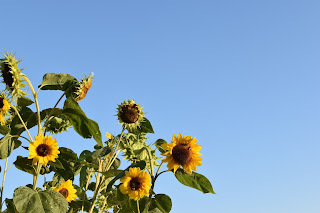 I did eat them standing in the yard and I did really enjoy watching them grow up the trellis. carrots // the traditional variety is doing really well. I've pulled up a few of these babes and they are growing nice and straight. I'm sure that they'll become oversized and gnarly in the fall but right now they are perfect. Lots of carrots for soups this winter. onions // doing just fine - but not amazing. While they couldn't be easier to grow, I'm not sure it's really worth it. I'm not exactly trying to become a homesteader and there just isn't the same degree of satisfaction from growing onions. peppers // giant failure. I have 5 plants and I've gotten two peppers, one of which actually went bad before I could even pick it. A bunch of water pooled on the top of it and softened the pepper and rotted it out. I keep seeing flowers on one of the traditional green plants and then nothing. 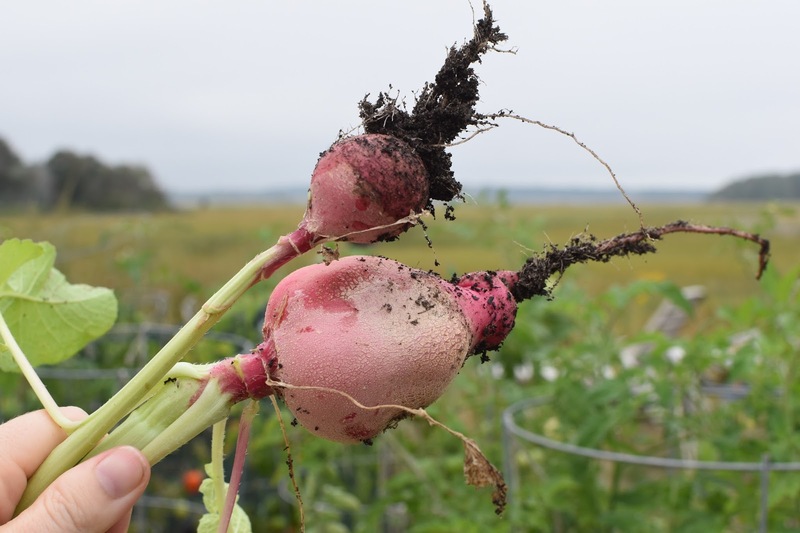 radishes // still crushing it. I just don't eat them nearly enough. Some of them might actually be overgrown now. I'm not a very good radish owner. cucumber // the mexican gherkin cucumber has grown more vines and at one point had a bunch of tiny little cucumber flowers. I only have about 4 or 5 itty bitty gherkins which is more exciting than not. They do look so incredibly different - but perhaps not worth all the emotional investment and enthusiasm that I have thrown to them. eggplant // love the petite little size of the patio babies. Only have gotten 2 so far. 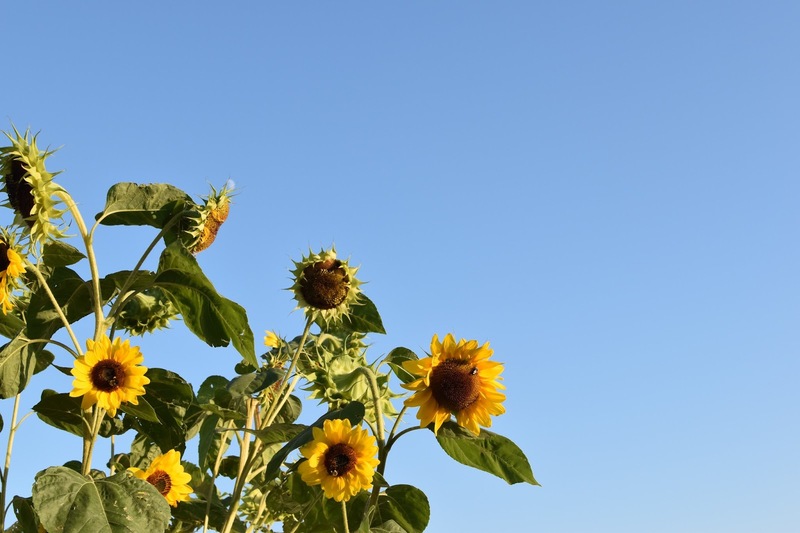 It's been behaving like the pepper plants - all the flowers, none of the fruit. zucchini // pretty productive. One of the squash plants suddenly died one afternoon - to the point where I questioned if I had accidentally over fertilized it or something, but according to the internet it fell victim to some squash bores - whatever that is. Next year? Need to find a better place to put this. It needs more personal space than I have afforded it - but to be fair, that was when I thought it could climb a trellis. 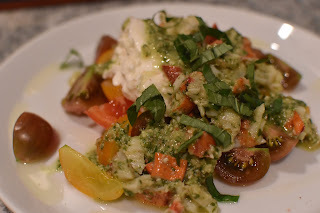 I'm going to admit that I've slightly overdone it with the tomatoes, burrata, and pretty much pesto of any form. It is pretty much the only thing that I've eaten for several weeks now. 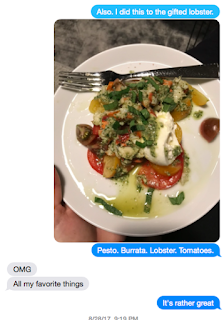 The fact that I've tired of burrata is terrifying to me. But - this season is fleeting and I'd rather eat them until I'm exhausted than have regrets in November. Ugh November. But last weekend we had some beautiful warm weather. Like the days we dream of all winter. I took a mid-afternoon kayak ride and timed it just right that I could float without the tides taking me away. Then we had a casual sunset bbq to capture more glow from our fleeting summer. When I lived in Boston, none of my neighbors gave me anything. I guess that's not totally true. I had Rinato who repeatedly invited me over for dinner but also said his wife would kill me. But - there was no "leaving things at doorsteps" happening. Which is really okay because this is a city and there are rats. But now, I have neighbors and last weekend one brought me a lobster. That he caught that day. And shelled for me. Since I was already in the middle of eating a hot dog and fritos (I'm fancy), I waited a night to capitalize on the lobster generosity. I think I nailed it - and you should also do this with your lobster. 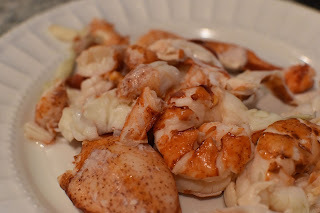 It is a perfect way to give people lobster in summer without going broke buying lobsters for everyone. Not everyone can have neighbors that drop lobsters at their door. Here's how it goes. It's incredibly simple - especially if you already have the pesto made and the lobster shelled. 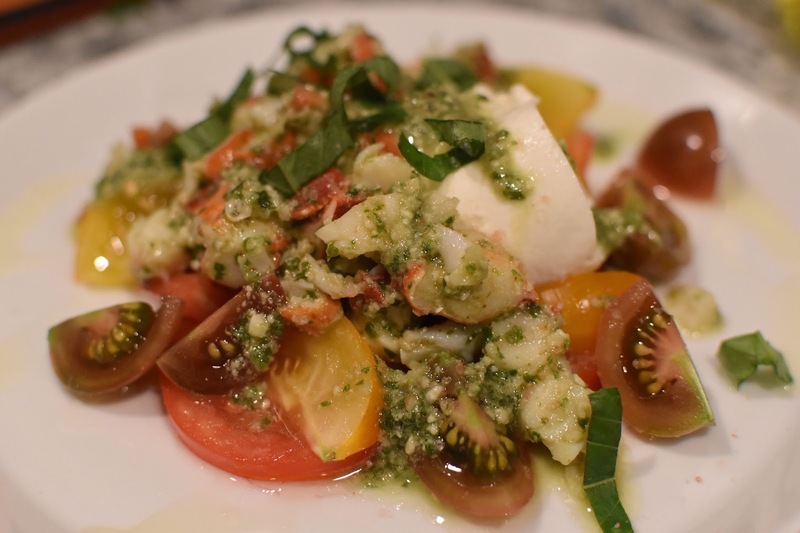 Using a food processor, prep and make your pesto. Follow this recipe here. I used walnuts for this pesto. Cut up your lobster meat to a medium/small size and then toss in the pesto. Plate the lobster with some freshly cut garden tomatoes and a half ball of burrata. Drizzle the plate with a bit of olive oil and sprinkle with basil and a bit of salt. I am not a chocolate person per say. I skew bacon and salt. I know those aren't the same - but it's true. I have an addiction to salt. I got it from my grandmother along with night terrors - both great traits. I'm a real catch. 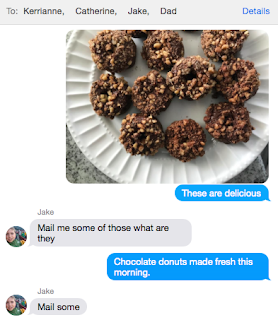 All that being said, I have frequently send urgent text messages to my sister demanding brownies. 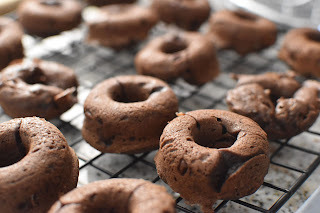 So, while these chocolate donuts are a little bit out of character for me... they are pretty much like a circle brownie that you can eat at breakfast time without judgement. 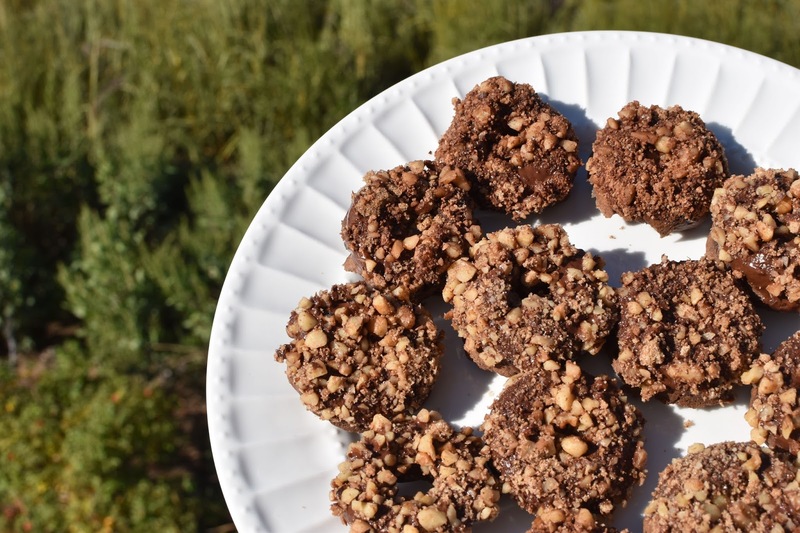 The recipe comes out with probably 2 dozen mini donuts... and you'll need every one of those. You'll probably eat two just to be sure they taste good. The real driver for making these came from needing to return my neighbor's plate. They brought it over to me with lobster on it... and it just felt right to return it with a little something. Their house is always BUMPING with people so mini donuts seemed like a good solution. I originally started off thinking about a coffee cake donut but after some googling ended up with this mocha situation. I'll be making another batch pretty soon because my baby brother politely requested a shipment at school. So here's how they go. It's all real straight forward and easy... until you start melting chocolate. That's where I begin to unravel and literally get it everywhere... but maybe you are a stronger person than I am. All in, you could get these donuts from ingredients to countertop in less than an hour and that sounds pretty good to me. Just pick up this donut pan from Amazon and you'll be ready to roll. Preheat the oven to 350F for the donuts. Grease your donut pan. 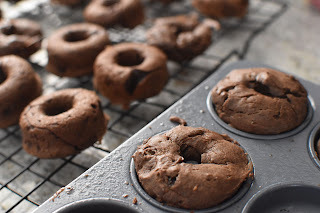 In a large bowl, mix together flour, cocoa powder, brown sugar, espresso powder, baking soda, and baking powder. Set aside. In a separate bowl, whisk egg, sour cream, milk, and coconut oil. Add the wet ingredients to the dry, whisking to combine. I added a little more milk to my dough to get it a tiny bit "looser". You don't want it to be thin like a pancake or even like cake mix, but it made it a bit easier to put in the donut pan. I'm sorry I can't be more specific here but just trust yourself and maybe add a dash of milk. Maybe. Transfer mixture into a pastry bag or large ziplock with a hole cut into the corner. Pipe batter into donut molds. 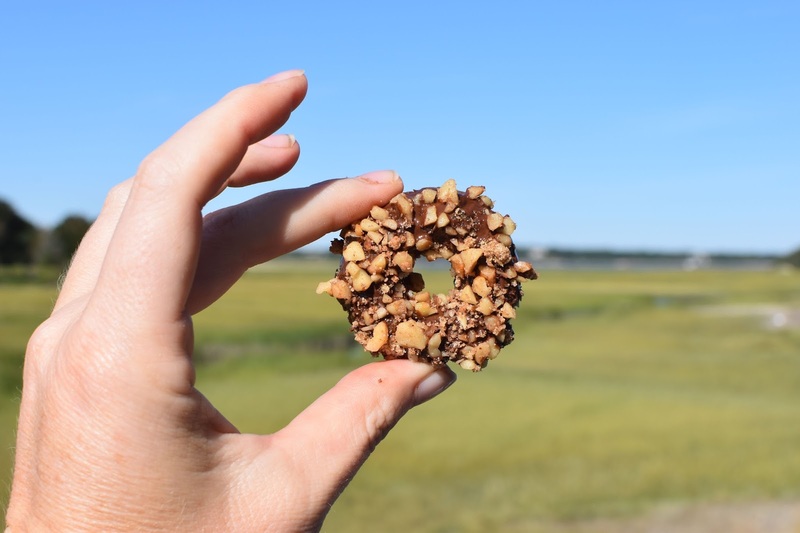 For full size donuts, aim for 2/3 full. For mini donuts, it's harder to do anything less than 100% full but just be sure to not cover the place where the hole is. 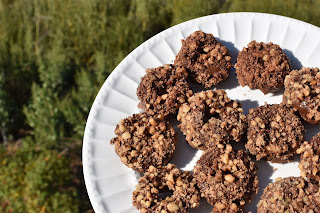 For the crunchy topping, combine some chopped walnuts, brown sugar, and a touch of cocoa powder. It's not a science so use the proportions of things you like the most. Melt your chocolate via double broiler (or microwave if you are very talented). I always add butter or coconut oil to smooth out the chocolate but it can be optional. 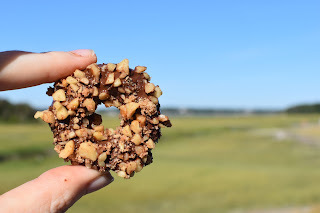 Dip each donut into the glaze, then dip into the crunch topping. Allow to cool slightly before eating.